I Don’t really recall how I found the book but nevertheless I bought a paper copy at Amazon. First of fall it is not an investment book but rather a management book. However, I think from time to time one should try to broaden the horizon and take a step back from investment book with “magic formulas” to pick winning stocks to books which try to explain how companies work. 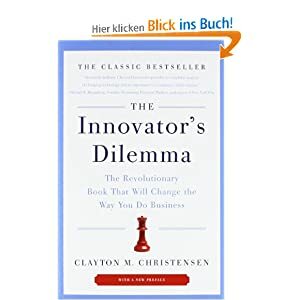 In “The innovator’s dilemma” the major topic is of course innovation and especially why so many seemingly successful companies seem not be able to be able to cope with innovation. The usual thesis is that those failing companies (Nokia anyone ?) have deficits in certain areas, be it management, marketing, organization etc. The author makes a very compelling case that in many cases, especially the “good companies” are not able to cope with innovations and get destroyed. The reason is what he calls a “disruptive” innovation or technological change which he contrasts to “sustaining” innovation. A sustaining innovation is a technological change which brings direct advantages to existing products and especially the most important current customers of the company. Good companies which “listen to the customer” do not have big problems with this. If an innovation makes sense for those customers, mostly established companies will be leader in the innovative technology. A “disruptive” innovation according to the author however is a new technology which at first does not offer anything to the existing customers. In this case, a customer focused company will not use many resources to develop the new technology much further. However another company or organization might bring the new technology to new clients which haven’t used this type of product before. The new technology then gets developed further for this new clients until the point when the new technology is so competitive that it is better than the old one and those “old customers” start switching. At this point in time it is too late to catch up for the old company. The author has used mainly the disk drive industry to illustrate his theory in great detail plus some examples from other areas. 1. Value Traps: Whenever you look at a cheap technology company, there will be a high likelyhood that it might be fighting against a “disruptive” innovation and might get “killed” soon. Current Examples could be RIM, Dell, HPQ or even Microsoft. 2. Even for great companies with a high moat, there might be already a disruptive innovation out there which might kill the company at some point. So it is not enough to look a direct competitors, but one should also look out “below”. Overall I can highly recommend the book to anyone who is interested in company analysis and wants to better understand how innovation is impacting (and sometimes even destroying) companies. In Memory Databases as SAP Hana are current examples of a disruptive innovation in databases, “In Memory” within the meaning of designed and written to be DRAM IMDBs. Risks in the wake of disruptive innovations are not confined to “technology” companies, but every great company has the ability to respond in a timely manner. Microsoft is still an example of this.